La Campagnuola warmly welcomes you to experience the best of traditional Sicilian food, whilst enjoying all the comfort and hospitality our island is famed for. We do all we can to ensure that every dish we serve authentically captures the sunny spirit of Sicily, and we only use the freshest Italian ingredients, lovingly prepared by our passionate family team. At La Campagnuola, making delicious food is a passion we love to share with our customers. 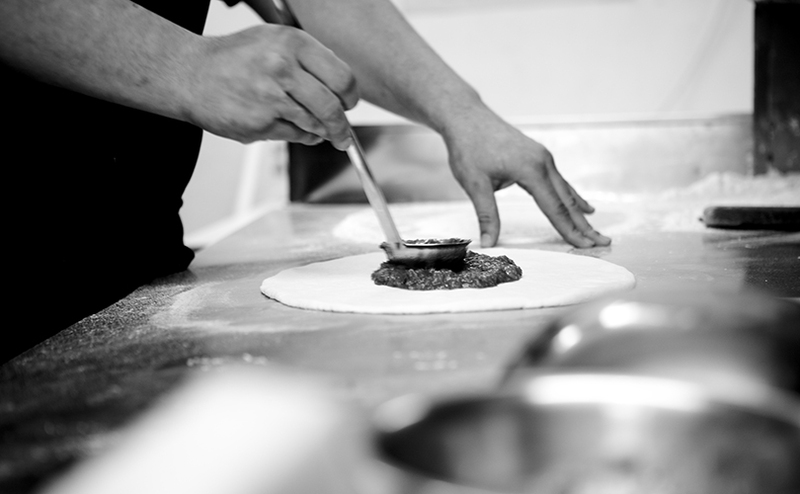 Come in and try our traditionally made pizzas, topped with fresh and authentic Italian ingredients, and share all the warmth of real Sicilian home cooking with family or friends. With a wide range of flavourful and lovingly crafted delights to choose from, there is truly something for everyone. Sourdough, tomato sauce, garlic, capers, anchovies, chilli and parmesan. Sweet and sour aubergine dish with crostini. Veal meatballs in a tomato sauce. Wild mushrooms and pecorino cheese on artisan bread. Squid lightly fried with aioli dip. Fior di Latte mozzarella, breaded with tomato dip. Mussels with white wine, crushed tomato and chilli. Tomatoes, garlic, onion, basil and Sicilian olive oil on artisan bread. A platter of Italian cured meats and marinated vegetables. All pizza’s are 12”. Gluten free option also available. Tomato sauce, Fior di Latte mozzarella, parmesan and basil. Tomato sauce, Fior di Latte mozzarella, n’duja, salami, garlic and chilli. Tomato sauce, Fior di Latte mozzarella, black olives, anchovies and wild mushroom. Tomato sauce, Fior di Latte mozzarella, mascarpone, parmesan and wild mushroom. Tomato sauce, Fior di Latte mozzarella, wild mushroom, black olives and artichoke. Tomato sauce, Fior di Latte mozzarella, king prawns, squid, mussels, anchovies and garlic. Tomato, prawns, garlic and cheese. Tomato sauce, Fior di Latte mozzarella, mascarpone, veal meatballs, salami and porchetta. Tomato sauce, Fior di Latte mozzarella, parma ham, black olives and artichoke. Four Italian cheeses and rocket. Tomato sauce, Fior di Latte mozzarella, fresh spinach and whole egg. Semi sun-blushed tomatos, parmesan, Fior di Latte mozzarella, goats cheese and red onion. Fior di Latte mozzarella, mascarpone, parmesan, onion, porchetta, rocket and truffle oil. Half portions and gluten free options are also available. Homemade pasta, meat ragu, béchamel and mozzarella. Spaghetti with a meat ragu. Penne with homemade tomato sauce. Buccatini with cream, pancetta, parmesan, parsley and egg. Linguini with fresh seafood in a light cherry tomato, white wine, parsley and chilli sauce. Pappardelle, wild porcini mushrooms, cream and white wine sauce. Penne in a aubergine and tomato sauce with salted ricotta and basil. Homemade pasta filled with spinach and ricotta. Pappardelle ribbons and homemade meatballs in a traditional tomato sauce. Main courses are served with seasonal vegetables. Additional sides are available to order. Chicken leg wrapped in pancetta, stuffed with Sicilian sausage and a white wine and rosemary jus. Butterflied chicken breast, wild mushroom, onion and Marsala sauce. Escallop of veal in breadcrumbs, served with spaghetti in a tomato, garlic and basil sauce. All steaks are 28 day aged, flame grilled and come with homemade chips and vegetables. Homemade jus, pepper, brandy and cream. Creamy dolcelatte cheese, white wine and cream. Seafood stew with fresh fish of the day. Served with homemade garlic rubbed crostini. Salmon, white wine, capers, cherry tomatoes, rosemary and potatoes. Mixed leaf salad, red onions, semi sun-blushed tomatoes, goats cheese, grilled marinated artichoke in reduced balsamic dressing. Tomato, buffalo mozzarella salad with fresh basil seasoned with Sicilian olive oil. Mixed leaves tomato, cucumber, onion, olives and peppers. Rocket and shavings Gran Padano parmesan dressed with balsamic and Sicilian olive oil. Traditional open frittate with breadcrumbs and parmesan. Served with chips and salad. Fresh tomato, peppers, onion, mushrooms, basil and cheese. Fior di Latte mozzarella breaded, served with tomato dip. Rice balls lled with a meat ragu, peas and mozzarella. Fried pasta, anchovy, onion, garlic, chilli, parmesan and egg. Rolled sardines, raisins, pine kernals and lemon. Mixed diced salami with Italian cheese and olives. Sicilian bread with olive oil, parmesan, basil, salt and pepper. 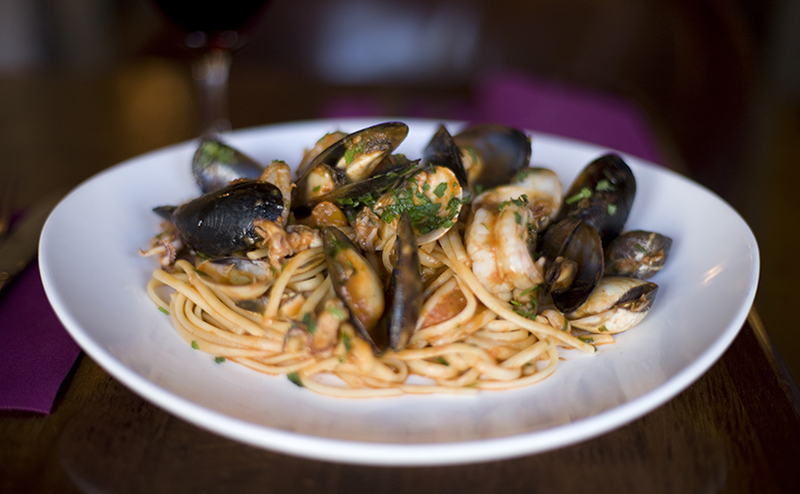 Whatever the event; family occasions, business dinners, romantic meals or just a relaxed night out with friends, La Campagnuola can make it a memorable success with our traditional, delicious Sicilian cuisine, and warm, authentic Italian atmosphere. From beautifully crisp, stone-baked pizzas, to countless other fresh Italian treats, you and your guests will be delighted you chose La Campagnuola. Ripasso di valpolicella classico, d.O.C. A quality shiny red wine, it’s complex, dry and full bodied. Best enjoyed with truffle courses and red meats - 14%. Filippo was born in the small village of Grotte, Sicily in 1942. As a teenager he moved to Bristol and dreamed of bringing all the warmth and passion of his family's cooking and hospitality to this little part of town. The result was La Campagnuola, opened in 1980 and now run by Filippo's children, Vincenzo and Mariangela who are keeping their father's dream alive by continuing to introduce customers to authentic, lovingly crafted Sicilian food.